My husband and I recently spend a fun long weekend in New York City, so here is a report on the good food we had on our trip. Links are at the end of the post. Lots of photos in the post! We didn’t make it here last time we visited the city and I wasn’t going to miss it again, especially since there are several locations. We went to the Hudson Street location (I think that’s in SoHo, but don’t quote me), and it’s a really neat store with friendly employees. 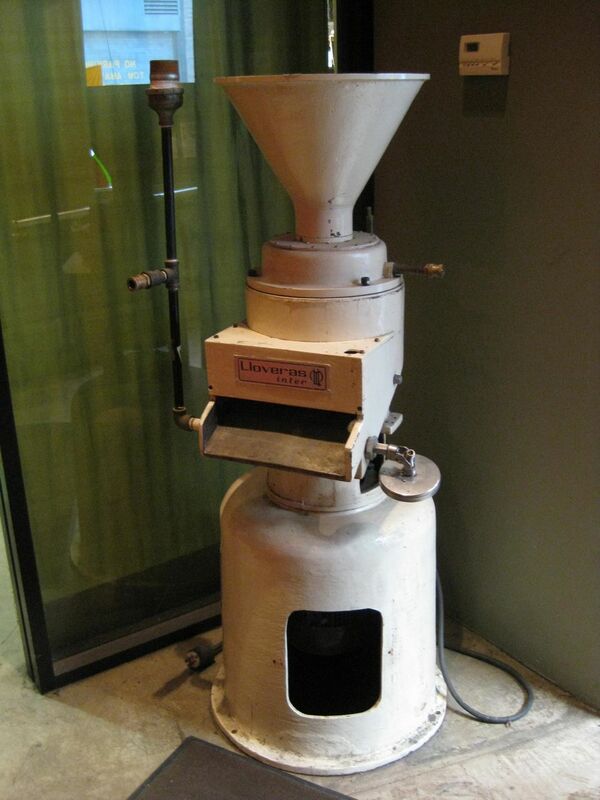 Here’s a piece of vintage chocolate-making equipment that is on display. There are also windows where you can see the behind-the-scenes happenings in the store. The first thing I did when we walked in was look for the famous chocolate chip cookies! After sitting down to share one of these huge cookies (which is approximately 80% chocolate), we were ready to head out and do more exploring. Here’s my bag of goodies. They had so many delicious-looking and cute creations in the shop. It’s hard to see, but in the lower-left corner of the bag there is a super-cute chocolate hen. I must have been really tired from walking around the city, because I can’t believe I didn’t buy at least three times more than I did. I had so many bakeries and candy stores on my list of places to go, but this is the only one we made it to. It was worth it though! I’m so glad we went to this is an Indian restaurant! It was close to our hotel, but I would have ventured out farther for the delicious Dhaba Shrimp Curry and Chicken Tikka Masala. 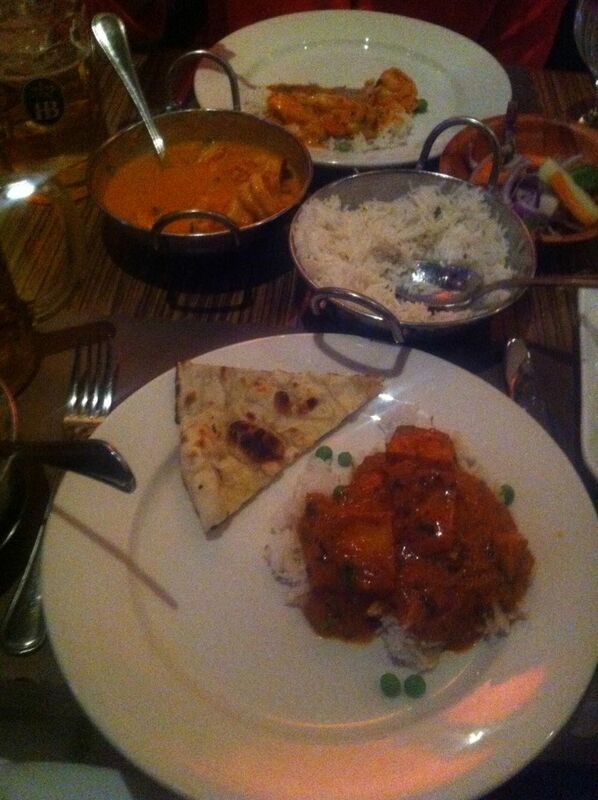 The complimentary Papadums and the assortment of relishes that accompanied them were delicious, as was the Naan we ordered as an appetizer. Before we went, I read on Yelp that rice is not included with your order, which I find odd, but I was happy to have the heads up. We got one order of rice and it was enough for the two of us to share. This is an iPhone photo, but you get the idea. We ate there on a Friday night, somewhere around 7pm, and got one of the last tables in this tiny restaurant. We walked in on a Saturday at 1:30pm with no reservation. It was pretty crowded, but we were immediately seated. 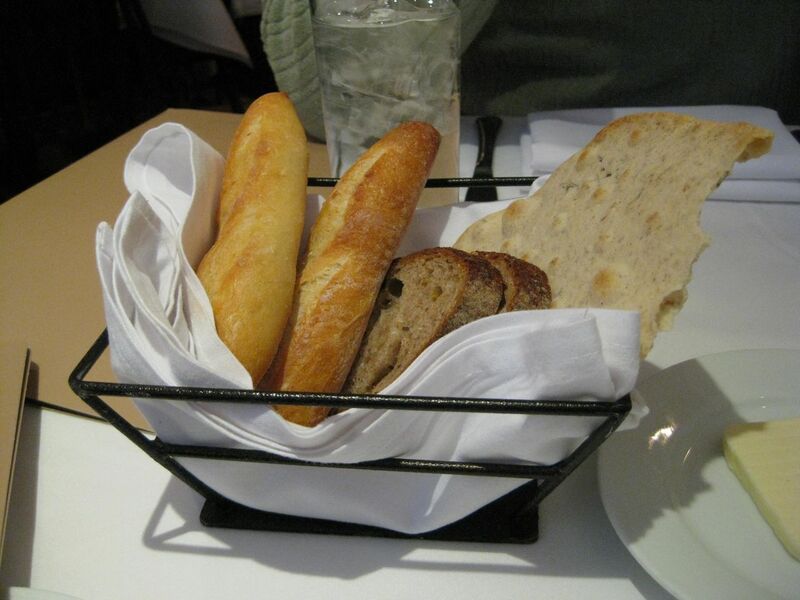 First off, this amazing bread basket. 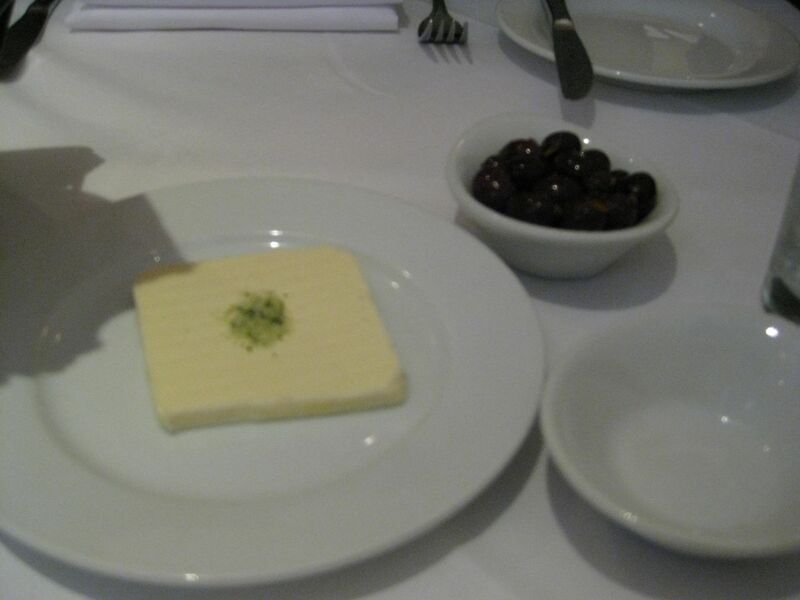 And don’t forget the butter, which had some kind of magical salt on top of it. And a bowl of olives! We both had the tuna burger. I thought it was going to be a piece of tuna, but it was actually ground up like a burger. The ginger on top is pretty, but that would be a heck of a lot of ginger to eat, so I pulled most of it off and added some of the grilled onion that was served on the side. 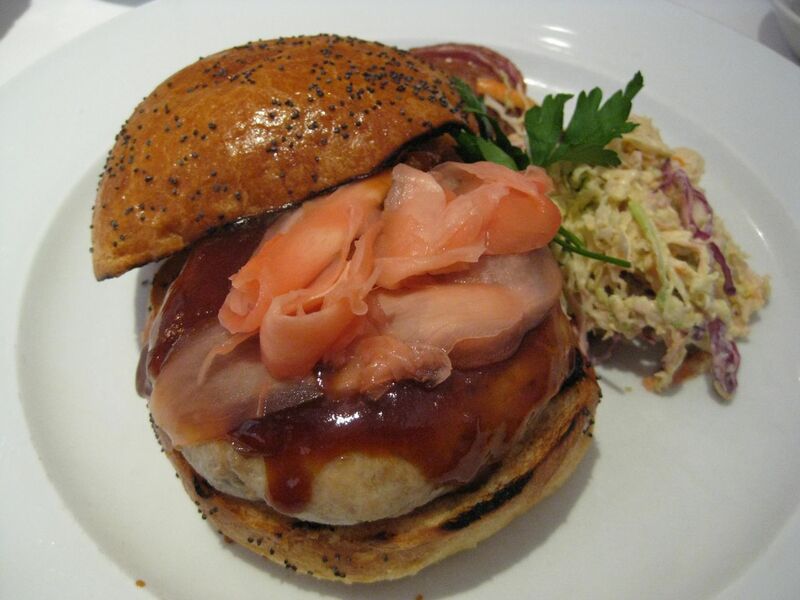 The sauce was sweet and gingery and I think the bun was brioche. The slaw on the side was creamy, crunchy, and didn’t last long on my plate! The people at the table next to us were eating an awesome-looking chocolate dessert, but we couldn’t even think about dessert after this huge lunch. We heard about this place while we were in New York and decided to give it a try. We were there on a Sunday night around 7:30pm and it was crowded, but we were seated right away; there was a wait for a table when we left. 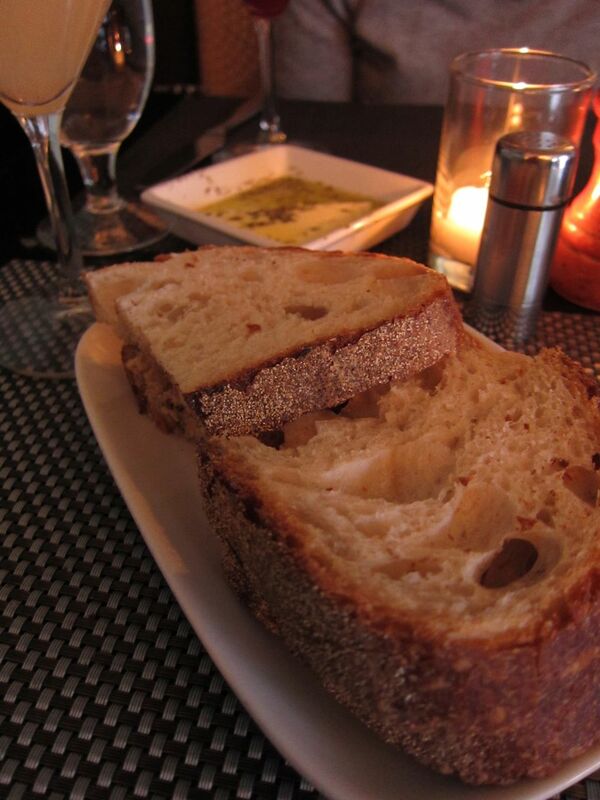 They have a coal-fired oven, which results in a bubbly, lightly-charred crust. 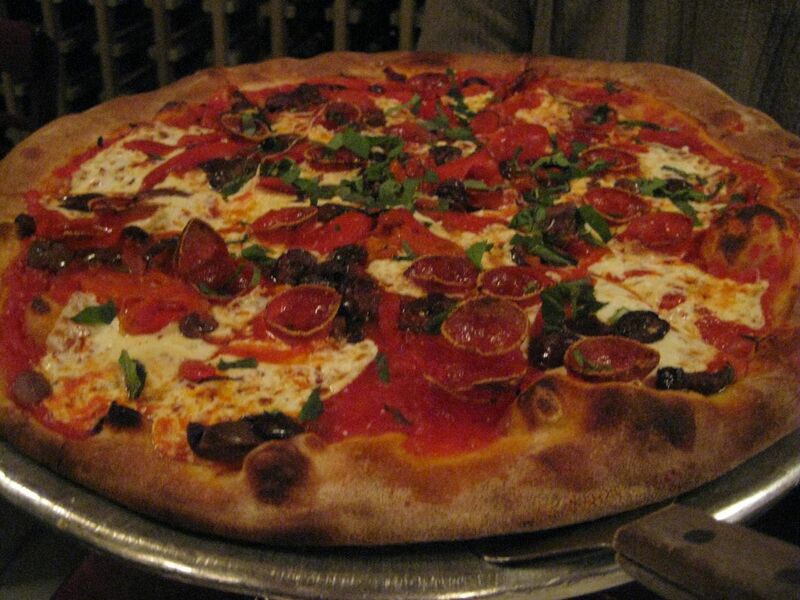 Our pizza with pepperoni, roasted red peppers, and kalamata olives was delicious. Really, really delicious. I am happy to report that we did not need the CPR kit. 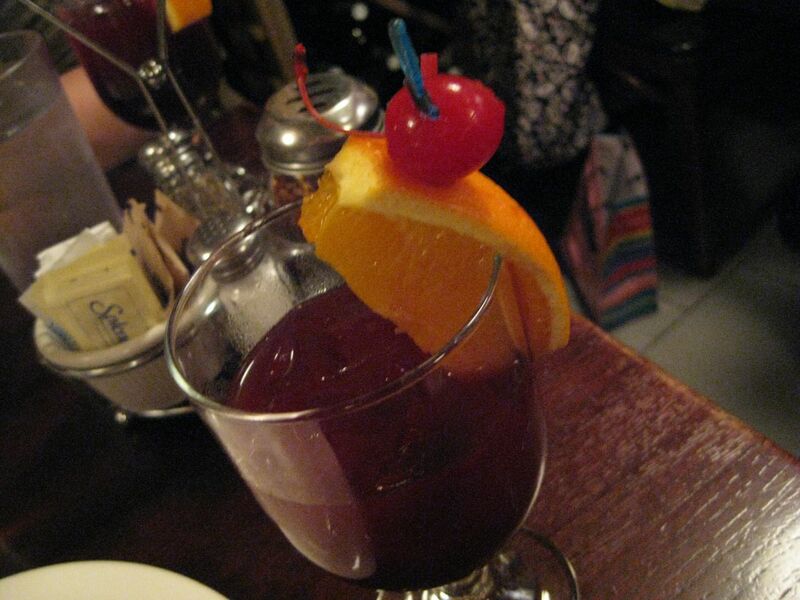 I am also happy to report that Lombardi’s makes good sangria! 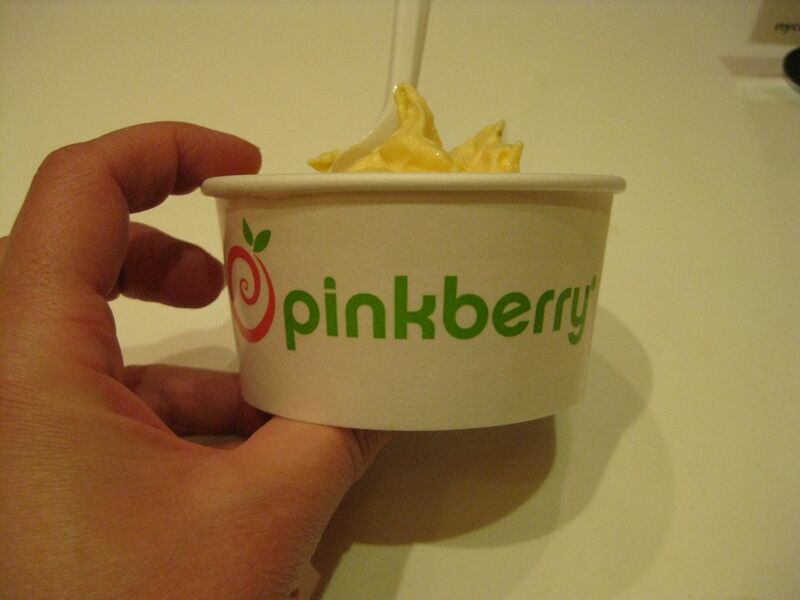 Lombardi’s does not offer desserts, but just down the street is Pinkberry frozen yogurt. 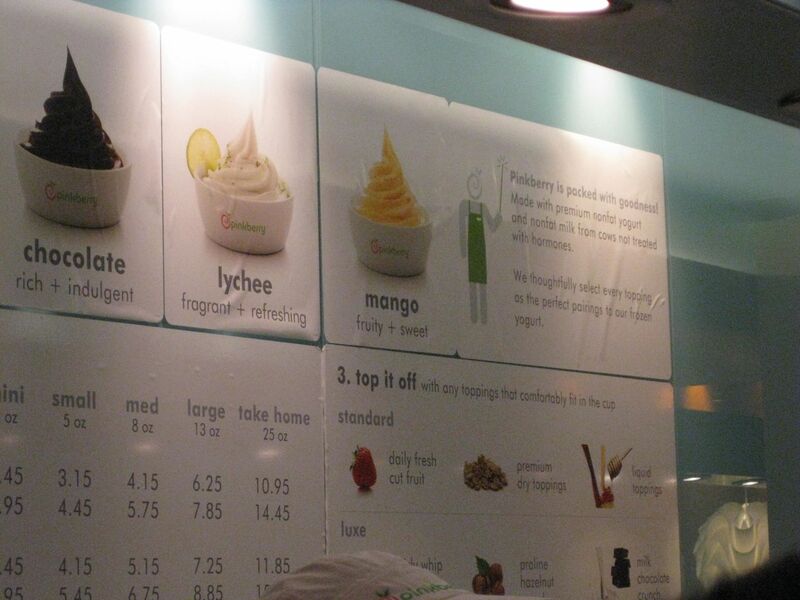 We shared a tasty dish of mango fro yo. I made a dinner reservation about one week in advance because I wanted to be sure that we had somewhere locked down for a pre-theater dinner. Marseille is a short walk from the American Airlines Theatre, where we saw The Roundabout Theatre Company’s production of The Importance of Being Earnest. We had a great dinner followed by by a thoroughly entertaining play. I had the Arugula Salad and Artichoke Ravioli. I couldn’t detect any artichokes, but the delicate ravioli was filled with creamy and smooth-tasting goat cheese that was delicious enough to make me forget about the artichokes. My husband had Spinach Salad and Grilled Salmon. I sampled both and gave them the thumbs up. We didn’t have dessert, but we did start out with a specialty martini. 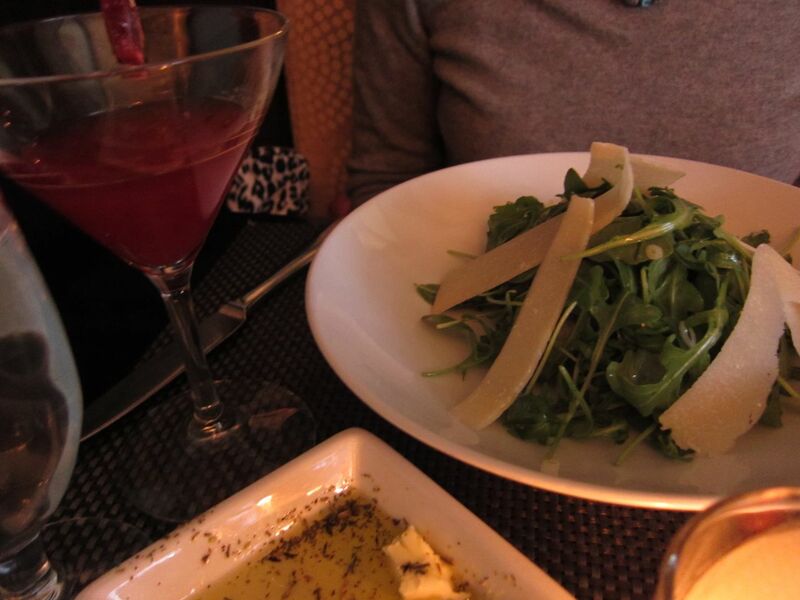 I guess I wolfed down the ravioli without taking a photo, but here are photos of some yummy bread, my arugula salad, and martini. Jacques Torres The website lists all of their locations; we went to Hudson Street. They post photos of their creations on their Facebook page, so if you like chocolate, you might want to Like them on Facebook. Dhaba 108 Lexington Ave. (between 27th and 28th streets). Marseille 630 9th Ave. I made a reservation through their website (they use Open Table). They called the day before to confirm, so be sure to give them a number you can be reached at a day in advance, or be sure to call them to confirm so you don’t lose your table. Union Square Café 21 E 16th St.
Lombardi’s Pizza 32 Spring St (between Mott St and Mulberry St). They don’t have much of a website; check Yelp for the address and reviews. 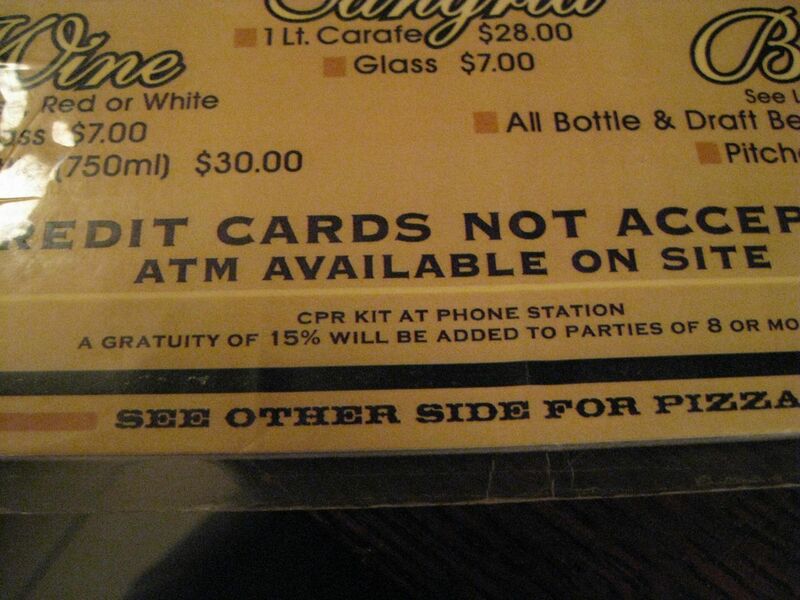 Note: no credit cards accepted, so bring cash. Pinkberry You can search for locations and see the seasonal flavor on their website. Yelp and Chowhound Manhattan Board and Chowhound New York City Restaurants are great for research. Last, but not least, check out my post about last year’s trip to New York City! This is great Jill! Love reading about your trip to NYC – I’m hoping to head there for a long weekend soon too and I’ll definitely refer back to your posts. This sounds wonderful! I can’t wait to get back to New York city! Looking forward to checking out last year’s post. What a fun read…enjoyed every word and every photo…thanks for sharing. Indian food is becoming so addicting here…I have been making it once a week and by the time we are at that day of the week, everyone is really looking forward to it. Your photo of it made my mouth water! Sounds like a wonderful time! 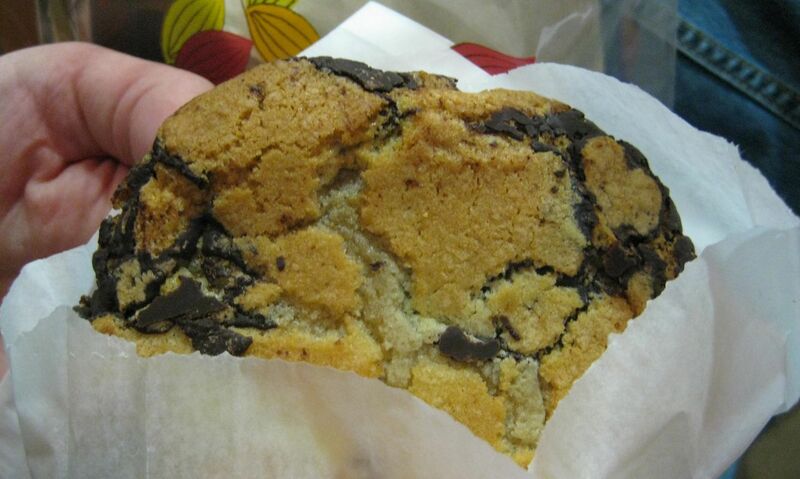 Wow-that cookie from Jacques Torres is amazing-LOVE the chocolate hen! Ohhhh, I’m envious – I haven’t been to NYC in close to 6 months and I’m suffering serious withdrawal! OMG Jill – am so jealous! I want to go to NYC very soon, and was going with a friend of mine, but she is looking for a new job, so not sure if that is happening now. Looks like you had a great time. 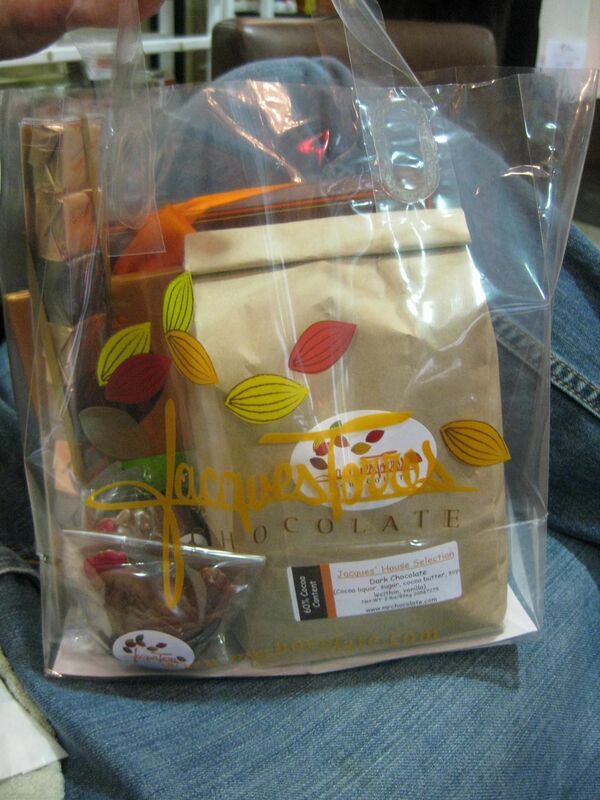 I saw one of those Jacques Torres cookies served warm on Amateur Gourmet today – they look so evilly good! Fun, Fun! Makes me want to get back to NYC–if even just for the JT cookies! 😉 I can’t remember, did you try the Levain cookies last time you went? Two different cookies and I love them both. You went to so many neat places! I am most envious of Lombardi’s and Jacques Torres. What a fun trip!